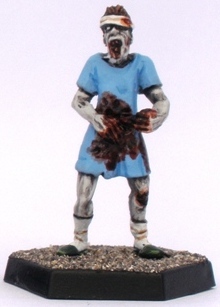 I had two zombie miniature related problems. 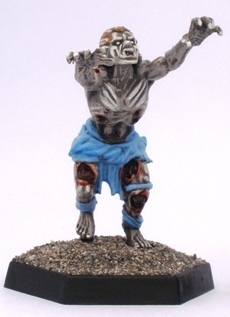 One issue was that the Mantic zombies and ghouls that I owned were going to be hard to make look like modern figures. The second problem was that I didnt have any figures that I had specifically designated for use as fast/rage zombies in games. I decided to kill two birds with one stone by theming my fast zombies as hospital patients. That way the slightly odd toga like clothing could be painted to feasibly look like hospital gowns. Thematically, the idea that some sort of “cure” administered in a hospital could have backfired and had a negative effect that created a more hyperactive version of the infected works for me. You could call it the “running” out of patients maybe, but Id rather you didnt. Having recently picked up the Studio Miniatures Big Zombie Deal I also decided to add the patients from Zombie Mob 5 who also fit nicely with my Patient Zero figure from last year. Hopefully the “proper” dead patients lend some authenticity to the Mantic stuff. 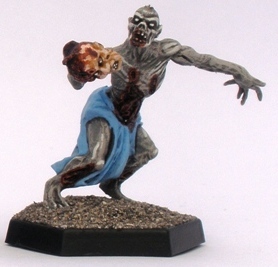 In keeping with how I am basing my zombies for gaming, fast zombies have a hex-base, while regular zombies have standard round bases and so on. Just in case anyone is wondering about why the bases vary. As ever the figures are painted to a decent enough tabletop standard and definitely not as display pieces. This is the first batch. I have a few more batches coming up with similar skin tones but wearing different gowns and the like. There will be twenty eight or so when the sub-project is finished. Smart use of the Mantic zombies, to make them fit in a modern environment. Actually on a second look, I see you based that chopped up zombie on regular round bases. So does that mean it’s not a rage zombie? They look good anyway, excellent job! Thanks for the feedback apeekaboo! I am glad that you like them. You could try to start an argument re the torso-less zed, but there wouldnt be any point: you are of course right. I am sure that any clear thinking zombie afficionado reading this agrees that in the realms of pseudoscience induced zombies a pair of legs with only a spine on top does not function. Spinal cord trauma incapacitates zombies. Of course, as Mantic supplied spinal cords I am going to use them just for variety in assembly and painting. Imagine the figure as representing a zombie in mid-explosion, rather than an independent threat, a bit like Hannah. Definitely getting into Brain Dead/Dead Alive territory there I think. Finally helped with my decision of what to do with my mantic ghouls,excellent stuff you have done there. Thanks TAL, glad to be of service. I wasnt sure what to do with the figures myself for a while either but I think that the hospital gown thing works well. Feedback has been overwhelmingly positive so far too. If you do take a similar route with your Mantic Ghouls then be sure to let me know. 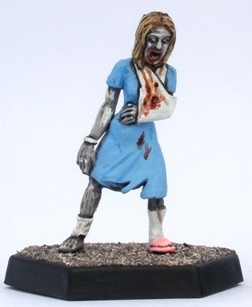 I would love to see more example of the figures painted with modern zompocalypse in mind. Thanks for the feedback Mattias. I am glad that you like this batch as there are another twenty or so to go over the next few months. Mr. 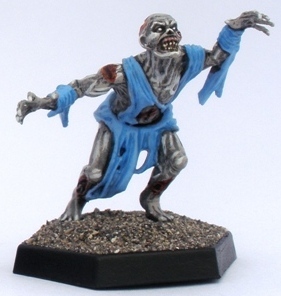 Shorten, you are nothing short(en, tee-hee) of a genius when it comes to zombie minis. That hospital gown idea was excellent. Never thought about that. Another choice might be some sort of clerical vestments (think Catholic church), but I think the hospital gown thing is more instantly recognisable. White or pastel colours might work as well. Thanks for the feedback Mikko.